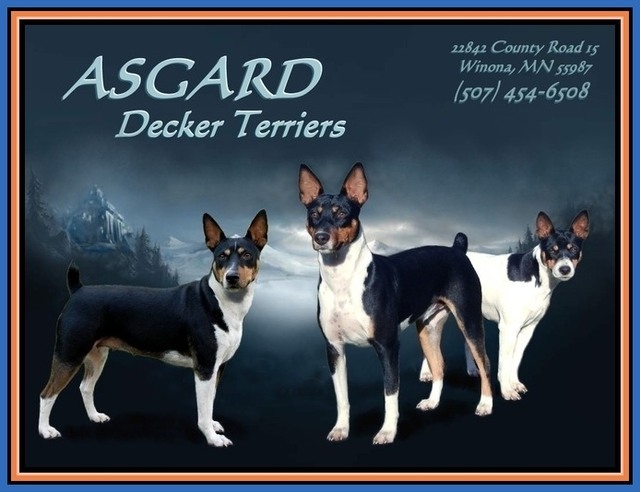 As we searched for our ‘perfect dog’ in 2009, we ran across the Decker line of Rat Terrier on the internet. We were instantly impressed by the carriage and confidence that these dogs showed in all they did. It was amazing to see them excel in almost every aspect of ‘dog activities’ from hunting, to agility, to family companion, right on into the show ring. We had been looking for a good varmint dog that would also be a companion and a squirrel hunting dog. When we got Nessa we were happy to see how well she fit into all aspects of our life here. We were so impressed with Nessa that we have added Odin and Frigga to our family. Check back for updates and progress reports on our dogs...they're still young and they are learning at a phenominal rate! This specific type of Rat Terrier was developed by Milton Decker in the 1970’s as a hunting dog and a dog that was a joy to be around and own, in the family/farm environment. It turns out that they are so much more than that…this is a dog that can be at home with just about any job or task, in just about any environment. We have found them to be very smart, easy to train, loyal and loving. If you're looking for a supreme hunting dog…look no further. If you're looking for a family or companion dog…look no further. If you're looking for a show, agility or any ‘dog activity’ dog…look no further! Look at the Decker Rat Terrier…you won’t be disappointed. We are NOT breeding any of our dogs now...but are still very active advocates for the breed. We do have an album here where you can find 'available puppies' and several links to reputable breeders at the bottom of the page. There are also links to some great information about the breed. Please take a look & educate yourself!